Wednesday of last week we got our first sports injury. Let me rephrase that. The first sports injury for the kids. (Mickey has had his share and has now taken up the "old man" game of golf since he is banned from any sport in which he could get a severe injury.) Soccer season, practice anyway, started two weeks ago. All three kids are playing. We'll be running around like crazy on Saturdays and two evenings a week. What else are were we going to do for two months? Anyway, Meg was at her second practice and was playing goalie. 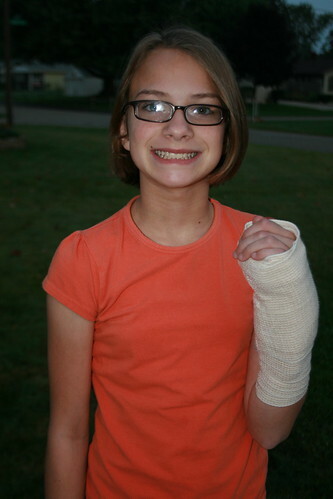 She was hit in the hand with a ball that was kicked hard. There was lots of crying. I wasn't there but this is what I've heard. Mickey brought her home and there was still a lot of crying. I suggested he take her to his aunt and uncle's for a quick look over to make sure it's nothing major. (There was no swelling, bruising, nothing out of the ordinary expect pain and restricted movement.) They were sure it wasn't badly broken. The wrist got wrapped and they came home. She went to school on Thursday and came home in more pain. I then decided to take her in on Friday. Friday morning the hand was swollen. We went to the doctor's and got an x-ray. (I love that our doctor's office is in the same building with a bunch of other offices with convenient services.) It's a buckle fracture. What? The hand got hit so hard the bone buckled up from the force of impact. So she's in a brace for at least a month and there will be no soccer for her except from the side lines as the assistant coach. (Isn't that nice of her coach to let her help out?) The worst part is it's her left hand and she's left handed. I've been writing her homework answers for her but she has to struggle right handed in class. Eating isn't too bad. Sometimes someone will have to cut things up for her but otherwise the food gets to her mouth. She seems to be handling it alright. The nice part is that it's a brace so it can come off and she can shower without too many problems. We go back next month for another x-ray and check up. Maybe she'll get to play the last few games of the season. I resent the "old man" comment and empathize with Meg. Get well soon as I hear your team could use an offensive weapon. And I don't mean the smelly type.